Boccaccio’s Decameron, Day 4 Story 5. Translation (c) 2016 Christopher DiMatteo. All rights reserved. Filomena’s story, in which the brothers of Elisabetta kill her lover: he comes to her in a dream and shows her where he is buried; she secretly digs up his body and puts his head in a pot of basil; and she cries over it for an hour every day, her brothers take it away from her and she dies of sorrow a short time later. Isabella and the Pot of Basil, by William Holman Hunt (1868, public domain). 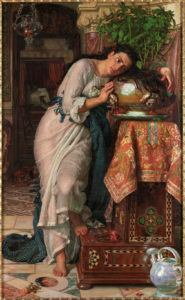 The name “Isabella” is a reference to a poem by John Keats which tells this same story in 63 eight-line rhyming stanzas but which changes this character’s name to Isabella. When Elissa had finished the previous story, and after the King (for the day) had pronounced his appreciation of it, it was then Filomena’s turn, who, full of compassion for poor Gerbino and his wife, began with a deep sigh. My story, dear ladies, is not about such wealthy people as those in the story that Elissa has just told, but as it happens, it is no less pitiful than that. It reminds me of a story that happened in Messina. So there were in Messina three young brothers who were merchants, who became quite wealthy after the death of their father, who was from San Gimignano. They had a sister named Elisabetta, a beautiful and well-mannered young lady, who, despite all good reasons was not yet married. These three young men also had a young man from Pisa named Lorenzo who lived and worked in their warehouse who took care of all of their business. He was a handsome and graceful youth. Elisabetta saw him several times and though it may seem strange she fell in love with him. Once Lorenzo became aware of this, after seeing her a few times he too fell in love with her and he left all of his other love affairs aside and he began to give his heart to her. And so it was that as they loved each other in equal measure, it was not long before they shared their love, and then they gave in to the desire that they had for one another. They went on in this way for quite a while to their great pleasure, until she failed to keep the affair secret enough so that one night, as Elisabetta went to the place where Lorenzo slept, she did not realize that her older brother became aware of it. As he was a wise young man, even if the knowledge of this was disturbing to him, he kept quiet about it and did nothing, even with many thoughts running through in his mind, until the next morning. When the next day came, he told his brothers that he had seen Elisabetta spend the night with Lorenzo and together with them, had a long discussion about it and decided to keep quiet about it so that no infamy would fall upon their sister nor upon them, from what he had seen and learned, until such a later time that they could cleanse themselves of the shame. And so they lived with this decision, making their usual rowdy jokes with Lorenzo as they had always done, until they pretended that they had to leave the city on business, and took Lorenzo with them. They brought him to a remote and empty place, where there was nobody watching them, where they killed him and buried him in such a way that nobody knew what they had done. When they returned to Messina they told the story that they had sent him somewhere on business, which was believable since they had used to do that many times before. As Lorenzo never returned, Elisabetta often asked her brothers about him, since she missed him. It happened that one day, when she insisted in asking, one of her brothers told her, “What does all this mean? What do you have to do with Lorenzo, that you are asking about him all the time? If you keep on asking about him, we will give you the answer that you deserve.” As the young lady was worried and sad, in fear and not knowing anything, she stopped asking, many times at night she called out to him sadly, praying for him to return. Since he never did, she missed him very much and nothing could bring cheer to her, as she continued to wait. So it happened that one night, having cried over Lorenzo so much because he never came back, she fell asleep crying. Lorenzo appeared to her in a dream, pallid and disheveled, with his clothes torn and filthy, and as he appeared to her he said: “Oh Elisabetta, all you do is call for me and my long absence has made you sad, and with your tears you so righteously accuse me, and for this you must know that I can never return since on the last day that you saw me, your brothers killed me.” And he showed her the place where he was buried, and told her not to call for him any more, nor to wait for him, and then disappeared. When the young lady awakened, believing the vision, she cried bitterly. Once she got up that morning, having no wish to say anything to her brothers, she determined to go to the place he had shown her and to see if what she had seen in her dream were true. And having got permission to go for quite a way out of town for a pleasure trip, and accompanied by a woman who used to stay with them who knew all about her story, as soon as she could manage, she left. At the place, she swept away some dry leaves on the ground. She found a place where the dirt felt softer and there she dug. She did not have to dig very far before she found the body of her poor lover, who was not yet broken down or decomposed. In this way it was clear to her that her dream had been true. She was sadder than any woman had ever been, yet knew that the present moment was not for crying. If she had been able, she would have willingly taken the whole body to give it a more appropriate burial, but seeing that she was not able to do that, the best that she could do was to use a knife to remove the head from the body which she wrapped in a towel, then she reburied the body and gave the head to her servant to carry. Nobody saw them and they left the place to return home. There she shut herself in her room with the head and cried long and hard over it so much so that she washed it with her tears and she gave it a thousand kisses all over. Then she took a very large pot of the kind used to plant marjoram or basil and placed it in there, wrapped in a nice cloth. She then filled it with soil and there she planed many stalks of the best basil from Salerno and only watered it with rose water, or water perfumed with orange blossoms, or with her tears. She got into the habit of always sitting near the pot and she would stare at it longingly, since her Lorenzo was hidden in there. Since she stared at it so much that she would begin to cry for a long time over it, so much that she watered the basil plants with her tears. Since it was getting such care, and due to the richness of the soil due to the head that was decomposing within it, the basil grew large and healthy and it was sweetly perfumed. Since the young lady always gave it such care, the neighbors took notice of this. They told the brothers that they wondered about how she had lost her beauty and her eyes seemed to come out of her head and they told her brothers: “We have noticed how she takes care of the plant every day.” The brothers, hearing this, understood what was happening. They scolded her for it but to no effect so they secretly had the pot taken away. When she saw that it was gone, she asked for it insistently but they never gave it back to her. She never stopped crying her tears and she became ill, saying all she needed to recover was to have her pot back. The brothers were struck with wonder at her demand and because of that they wanted to see what was in the pot. So they dumped out the dirt and they saw the cloth wrapped around the head, which was not yet completely decomposed and they recognized that it was Lorenzo’s by its curly hair. They were very surprised at this and they were afraid of anyone learning of this. So they buried it and without saying anything else they quietly left Messina, taking their accounts with them and moved to Napoli.